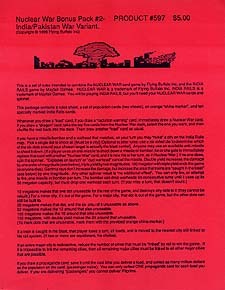 This is a set of rules intended to combine the Nuclear War card game by Flying Buffalo Inc, and the India Rails game by Mayfair Games. You will be playing India Rails, but you'll need your Nuclear War cards and spinner. This package contains a rules sheet, a set of population cards (two sheets), an orange "china marker", and ten specially marked India Rails cards.